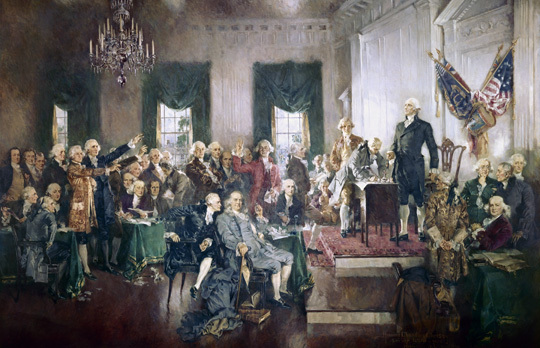 On Constitution Day 2014, the U.S. Capitol Historical Society celebrates the twenty Signers of the Constitution who went on to serve in the U.S. House and/or Senate. Sadly we cannot include the name of Elbridge Gerry (1744-1814) on this list, since this Massachusetts merchant’s Antifederalist affinities prevented him from signing the document—although once it was ratified by his native Massachusetts, he went on to represent the state in the House (1789-93) and served two terms as governor before dying in the second year of his vice presidency under James Madison, three months after the British burned the Capitol. He is the only Signer of the Declaration of Independence buried in the District of Columbia. Other names one might expect to see are absent from this list—George Washington, Alexander Hamilton, and Benjamin Franklin among others—because, although their contributions to the politics of the Revolutionary Era and the Federal Convention were notable, they never went on to serve in Congress. Abraham Baldwin of Georgia (1754-1807) was a Yale-educated native of Connecticut who represented his adopted state in the House (1789-97) before moving on to the Senate (1799-1807). He is the only Signer of the Constitution buried in Washington, D.C.
Richard Bassett of Delaware (1745-1815) was a wealthy planter who served in the Senate (1789-93). William Blount of North Carolina (1749-1800) was a planter and land speculator from a powerful mercantile family. He served as a state legislator and member of the Confederation Congress before his appointment as first governor of the Southern Territory (1790-96). 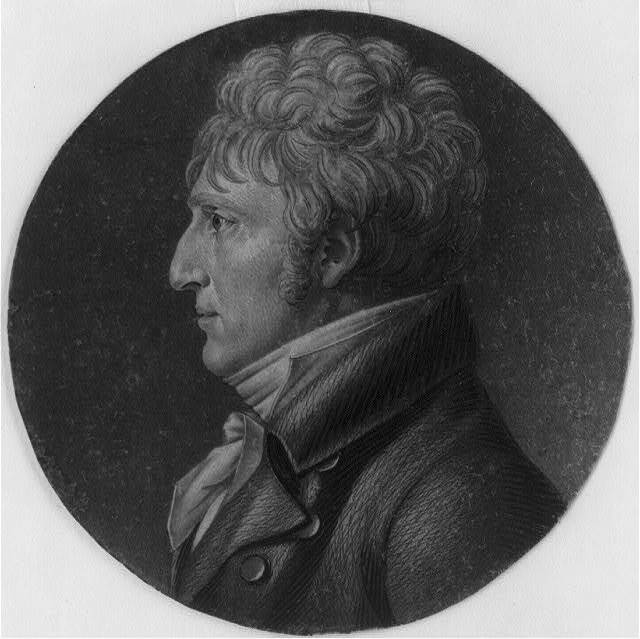 He was elected to the U.S. Senate in 1796, but shortly thereafter his seat was “sequestered” and he was effectively expelled for participating in a conspiracy to oust the Spanish from Louisiana. Daniel Carroll (1730-96), known as “of Rock Creek” to distinguish himself from several cousins of the same name, was a major landowner and planter in the part of his native Maryland that became the District of Columbia, which he voted for as Representative (1789-91). George Clymer of Pennsylvania (1739-1813), was a Philadelphia merchant who followed his single term in the House (1789-91) as a federal excise collector and Indian treaty commissioner. William Few (1748-1828) was born in Maryland but lived in Georgia from 1776 to 1799 before disgust with slavery led him back north, to New York City. After representing his adopted state in the Continental and Confederation Congresses (1780-82 and 1786-88), this wealthy planter served in the U.S. Senate (1789-93). Thomas Fitzsimons of Pennsylvania (1741-1811) was a Philadelphia merchant who served in the House (1789-95). A native of Ireland, he shares with Daniel Carroll the distinction of being the only Catholic Signers of the Constitution. Rufus King (1755-1827), a Harvard-educated Boston lawyer, was a rising star in Massachusetts politics when he married a New York heiress and settled in New York City in 1786. This did not prevent him from representing his native state in the Federal Convention, although he represented his adopted New York in the U.S. Senate (1789-96 and again in 1813-25). James Madison (1751-1821) of Virginia was not only one of the most important members of the Federal Convention, but went on to become the first informal “majority leader” during the early period of his long career in the U.S. House (1789-97), during which he deserved credit as “Father of the Bill of Rights.” He went on to serve as a state legislator, secretary of state under his good friend Thomas Jefferson (1801-09), and president (1809-17). Charles Pinckney (1757-1824) was a wealthy lawyer and planter of Charleston, South Carolina who served several terms in the Confederation Congress, the state legislature, and the governorship, in addition to the U.S. Senate (1798-1801) and House (1819-21). 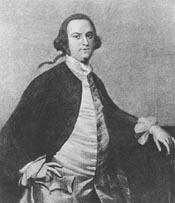 George Read (1733-98), a wealthy lawyer of New Castle, Delaware, held many offices in the state and as a member of the Continental Congress before attending the Federal Convention. He sent on to serve in the U.S. Senate from 1789 until resigning in 1793 to serve the remainder of his life as his state’s chief justice. Richard Dobbs Spaight of North Carolina (1758-1802) served as a Continental Army officer, a member of the Confederation Congress and state legislature, and governor before being appointed to serve out a brief, unexpired term in the U.S. Senate (1799-1801). Defeated for reelection, he was killed in duel with his successful opponent. Hugh Williamson of North Carolina (1735-1819), was a native of Pennsylvania who practiced medicine but earned a wider reputation for his literary and scientific pursuits. He served as a member of the Confederation Congress before entering the U.S. House (1789-93). Two hundred and twenty-five years ago today, the delegates of the Constitutional Convention met one final time in Philadelphia, and what ensued changed the history of this country and the world. When all was said and done, thirty-nine of the fifty-five delegates there voted to approve the document and affixed their signatures to it, marking the beginning of the Constitution’s road to ratification and formal adoption by the United States of America. It wouldn’t be an easy sell to all of the people and states in the Union, especially those wary of such a powerful federal government, but in the end the Federalists prevailed. With this anniversary comes an opportunity for reflection about the document, its purpose and meaning, and how much it might change as the 21st century continues to unfold. As I mentioned, the ratification of the U.S. Constitution was far from a guarantee, as there were many states where a strong federal government was akin to a tyrannical ruler, not unlike the monarchy they had just fought a revolution to break free from. Knowing they would have their work cut out for them, three of the framers of the Constitution put pen to paper in defense of this new document in what we call The Federalist Papers. Under the name Publius, John Jay, James Madison, and Alexander Hamilton, wrote a series of eighty-five essays in New York newspapers between October 1787 and August 1788 in a plea to the people of the State of New York to urge ratification of the U.S. Constitution. In them, each man took turns addressing the various parts of the Constitution, the reasons behind the creation of each part of the federal government, and overall why this was the best way forward for the country. These writings give us our most worthwhile insight into the men and ideas that created the great document and shaped our nation’s future. In rereading the Constitution and The Federalist Papers, the thing that strikes me the most is what is not there, more so than what is. We criticize today’s politicians for “punting” or “kicking the can down the road” on issues, to borrow some of the most overused catchphrases of American politics right now, yet is that not what the authors of the Constitution did on one of the key issues of our nation’s history, namely slavery? The Bill of Rights and all of the freedoms and guarantees given to us under those first ten amendments and all those that have come after, was not a part of the Constitution, but a separate document passed after the fact, and something not all the founding fathers liked the idea of back then. There is no mention of the word privacy in the entire document either, but do you know any American who doesn’t consider such a right to be inherent? My point here is not to point out shortcomings in our Constitution or the brilliant men who wrote it, it is rather to illustrate the fact that I think those men meant for the story to remain unwritten so that as times change, the document, the government, and the country could change with them and fill in new parts of the tapestry that is the American story. Not only through the amendment process did they leave the door open for the fact that they didn’t have all the answers nor the ability to predict the future, but also in what they left out, so that we could adapt our government and laws to the ever-changing times. The framers were very intentional in how they structured the government and set up a system of checks and balances; so too were they very intentional in what they did not specifically enumerate in the Constitution as they were counting on future elected officials and the courts to interpret those aspects of it that were either not politically expedient or socially acceptable to specifically mention or deal with in 1787. The Constitution is a living document that is meant to be interpreted as times change and the framers intended for it to be that way. And to those that would argue otherwise, I would say that all you have to do is look at how both sides of the gun control issue interpret the 2nd Amendment today. No matter our beliefs, we all interpret the Constitution to justify our positions on issues. Corporations are people or they’re not, depends on who you ask. I’ll leave you to decide. On September 17, 1787, the delegates of the Constitutional Convention gathered one last time at Independence Hall in Philadelphia to sign the document they had created. Having originally convened in February 1787 to amend the Articles of Confederation, it became quite apparent soon after they began work that simply revising the Articles would not be sufficient and that an entirely new document to set up an entirely different type of government would be necessary to fulfill the promise of the new American nation. The signing of the Constitution was, however, only the beginning of the story. Today, while politicians from the two major parties squabble over seemingly everything, the ideological difference at the heart of their arguments stem from one central issue: the size and role of the federal government. This continuing argument began in 1787; as soon as the contents of the new federal constitution were made public, the debate that began in secret between delegates of the Constitutional Convention soon spread throughout the 13 states. To many Americans, the idea of a centralized federal government with an executive seemed far too reminiscent of the monarchy they had just finished fighting to break free from. Even though the Framers were proposing a government that revolved around the legislative branch, not the executive, and that had checks and balances inherent in its design to prevent any one person or branch from consolidating power, people still felt uneasy…enter James Madison, Alexander Hamilton, and John Jay. 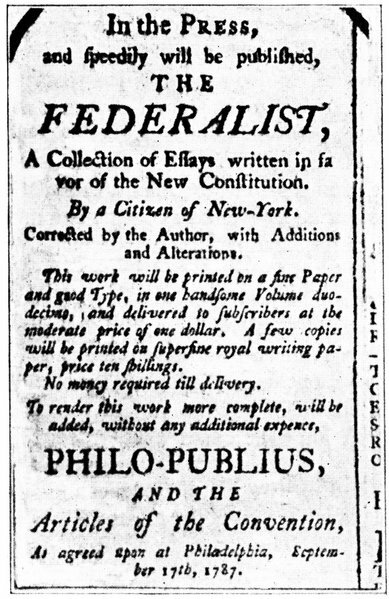 In an effort to assuage fears and doubts about the proposed constitution, Madison, Hamilton, and Jay penned a series of essays, under the name “Publius,” in several New York newspapers in an attempt to make their case to voters there. The essays, which became known as The Federalist Papers, are still our best window into the insights of the Framers as to why they believed so strongly in federalism as the best way forward for our country, its government, and its people. And while these essays were directed at the people of the State of New York, the arguments contained within them were echoed throughout the 13 states, culminating in the eventual ratification of our Constitution by all the states, with the last being Rhode Island on May 29, 1790. 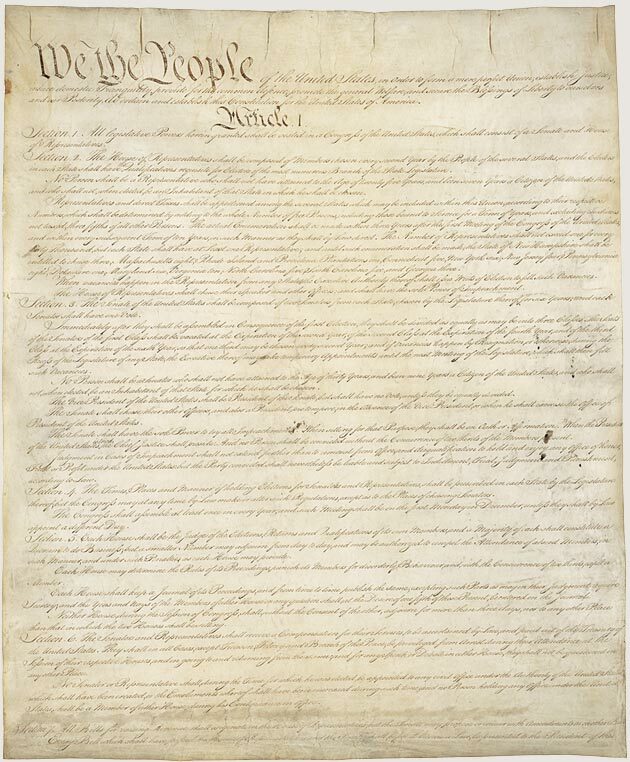 The Constitution is often referred to as a “living” document, and it has proven to be as it continues to guide us from year to year, generation to generation, constantly interpreted and reinterpreted to not only reflect what its Framers intended, but also to reflect all that has changed in how we live now in the 21st century. The Constitution is no less consequential today than it was in 1787; however, as Americans we too often take all that we have for granted. I hope that Constitution Day can provide everyone with some time to simply acknowledge, perhaps in slight awe, what our Founding Fathers created back in 1787, and how different we would be as a people and a nation if they somehow were unable to put the country first and reach a compromise—which is a lesson perhaps all of our current elected officials could do well to learn. How does your knowledge of the Constitution stack up? Take one of our Constitutional Quizzes–and report your score below, if you’re up for it. (We know about the error and the typo. Can you find them?) Or, do you have a favorite part of the Constitution? What do you admire most about it? Do you think it should be amended, and how?